16 April 2019: The Provincial Growth Fund will be a focus for us in 2018/19 and beyond. We intend to carry out additional work, building on our 2017/18 annual audit of the Ministry of Business, Innovation and Employment. 16 April 2019: During the Māori Affairs Committee’s Annual Review of Te Puni Kōkiri in December, committee members asked about an “incentive payment” that had been distributed to shareholders of a Whānau Ora commissioning agency. We reviewed the arrangements, and have written to Te Puni Kōkiri with our findings. 9 April 2019: The Minister of Education is consulting on proposals to reform the delivery of public vocational education in New Zealand. This is our submission on proposal 2. 9 April 2019: The Independent Taskforce on the Review of Tomorrow’s Schools has recommended changes to the education system. Although we do not have a view on the proposed structural changes to the education system, we have written to the Taskforce setting out some matters for it to consider as it develops its proposals further. 1 April 2019: Most government spending for the first six months of 2018/19 has been properly authorised and is within the law. However, we have confirmed two instances that were not properly authorised. 18 February 2019: The Productivity Commission has released an issues paper that will inform an inquiry into local government funding and financing. 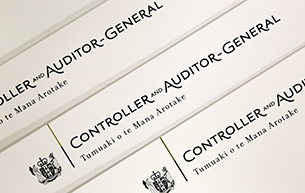 This letter provides written comments from the Office of the Auditor-General. 14 February 2019: As part of phase 2 of the Reserve Bank Act Review, the Treasury has issued a consultation document which looks at the financial policy framework for the Reserve Bank of New Zealand and how it should evolve. This letter is our written submission.